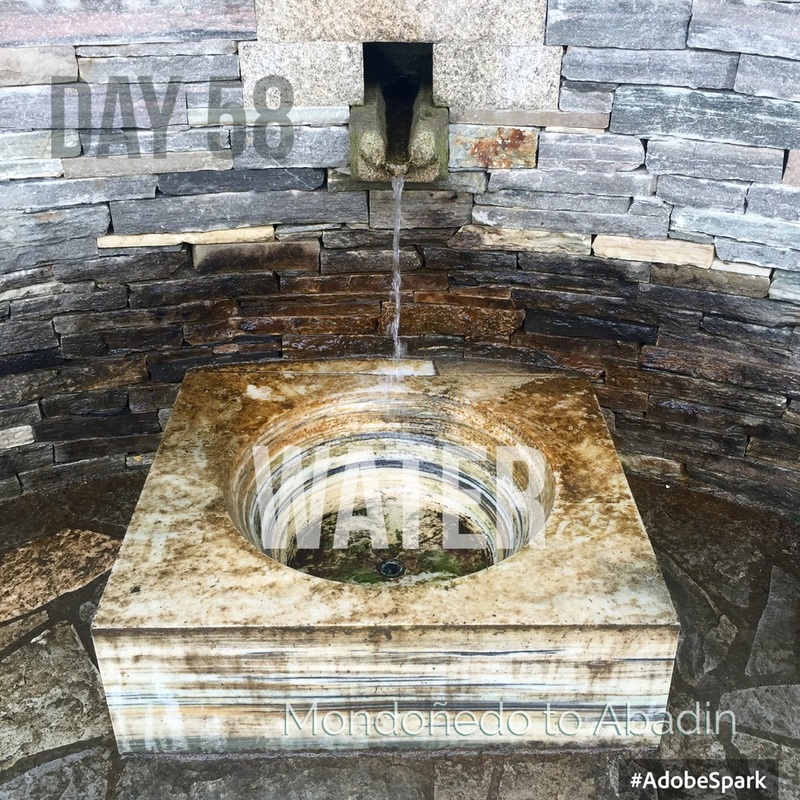 DAY 58. 4 JULY 2016. 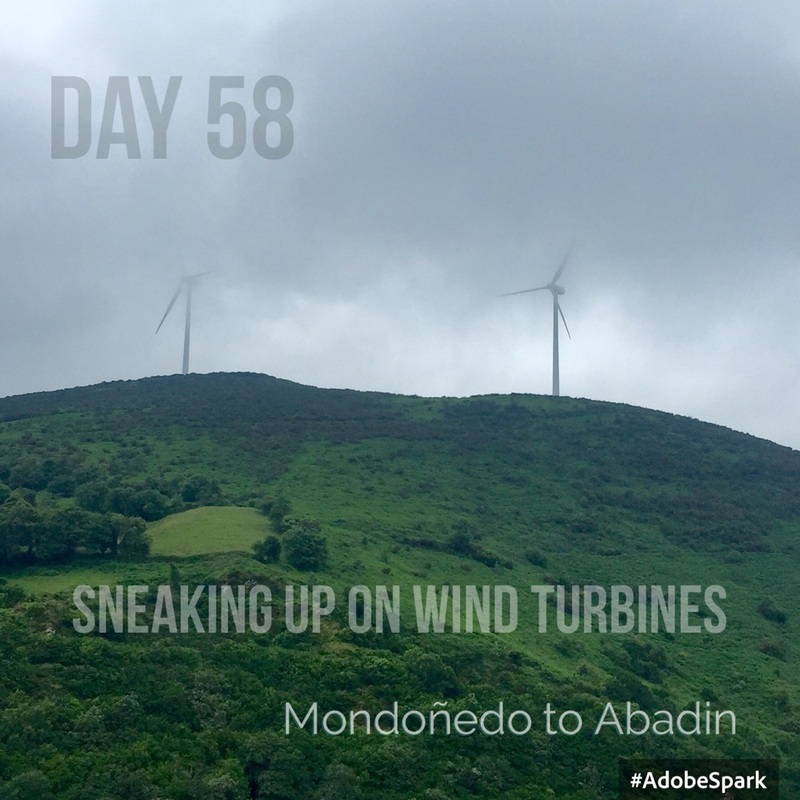 MONDOÑEDO TO ABADIN. A grey day. I arrive at the Bar Peregrino at 8am just as it was opening for breakfast. Hot milk, a bun and toast and jam and orange juice. He also makes me a cheese sandwich and sells me a can of green olives for lunch as the supermarket doesn't open until 9am. There are some steep ascents today; the wind turbines that yesterday were tiny white pins on the distant hills are now looming huge in the mist, across the valley. About 10am I am overtaken by a group of five boys on their fifteen year old legs. Whoosh. I arrive at Abadin about 1pm. It's a small mountain village swathed in mist and rain today. The albergue is a very nice modern building and the village has obviously received lots of funding; it has a new cattle market and fruit and vegetable market. But today it's deserted apart from a group of pilgrims queuing in the rain for their beds. There are a Polish couple, a Belgian guy, two German women, an Italian who looks like a Viking, complete with forked plaited beard, a group of young Spanish girls and the five boys- who are very sweet but who manage to weld pasta onto the bottom of the only saucepan in the kitchen. The German women can't help but tackle it with the Brillo pad. The albergue has a tumble-drier so I give my sleeping-bag a blast on full heat. Hopefully, that's dealt with the bed-bugs. I go out for a Menu del Dia at 7.30pm at the local bar, which looks very unpromising from the outside, but I'm shown into a spacious dining room and served a very nice meal for 9€. Fabada bean stew followed by several baby trout and chips with a carafe of white wine and fruit. Simple but well cooked and delicious. It's a full house and the Polish couple have to camp in the garden. There's lots of younger people now that school holidays have begun. The Camino is going to start getting busier from now on.